Just one day in at the Salon International de la Haute Horologie (SIHH) and Baume & Mercier has announced the Premiere of a new Men’s Watch Collection and a Celebrity Design Collaboration. 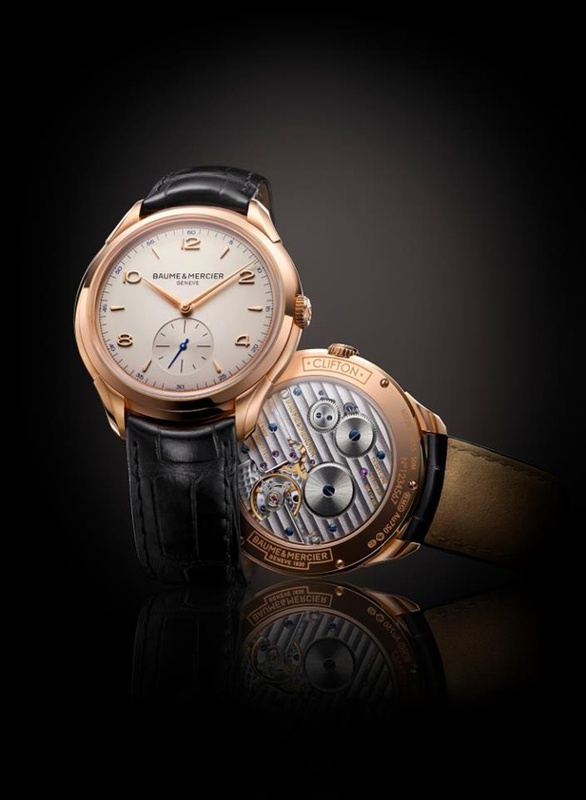 Baume & Mercier’s new Clifton collection is a contemporary and modern interpretation of the men’s classic round watch. The sun satin-finish dialsfeature a sophisticated double-beveled design, curves on the case and the bezel, sapphire case back and small complications on some of the references. Each model is clad in steel or 18K red gold and finished with an alligator strap or stainless steel bracelet. The Clifton 1830 model, could be considered the cornerstone of the collection. 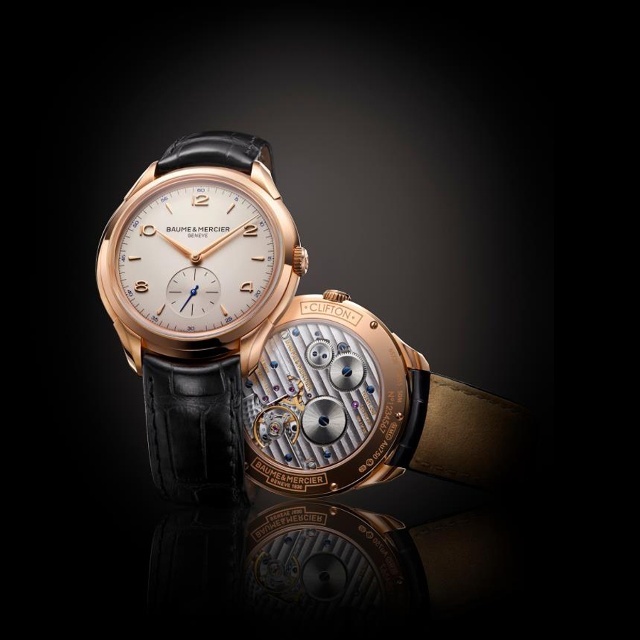 This watch, made in 18K red gold, measuring 42 mm in diameter, and traditionally worn upon an alligator strap, houses a caliber of the La Joux-Perret manufacture. It is manually-wound and said to be the most accurate interpretation of the historical model from the Baume & Mercier Museum in Geneva. It is truly a collector’s piece. The Clifton collection will launch at retail in April 2013. 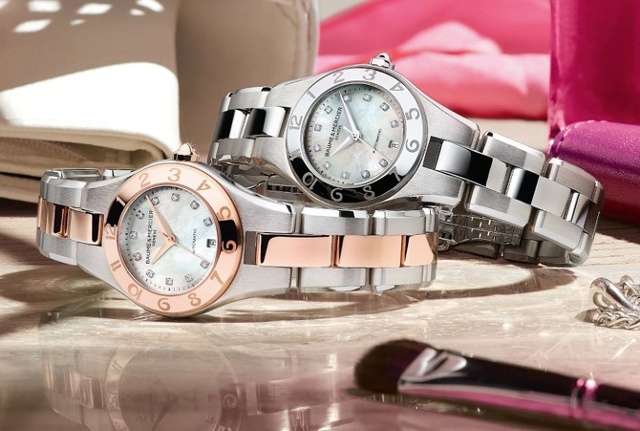 Baume & Mercier is also introducing some additions in the women’s watch category. The Linea 27 mm series features interchangeable straps in hand-woven leather in various colors. The series was created in collaboration with actress, Emmanuelle Chriqui; as well as two new mechanical models from the Linea 27 mm collection. This new design collaboration with Chriqui, best known for her role on HBO’s Entourage as Sloan McQuewick, has been a fan of the brand for the past two years. Chriqui worked with Baume & Mercier to put her own modern spin on the Linea by introducing a casual-chic woven lambskin strap. I’ve always had an affinity for woven leather. Its handcrafted, artisan appeal is such a great, yet unexpected pairing with the Linea watch. The strap is so soft and supple, Chriqui said. We chose a color palette of white, orange and beige; very light and beachy, paying homage to Baume & Mercier’s Seaside Living mantra. I’m a huge fan of the Baume & Mercier brand, it was an absolute thrill to work alongside their design team in Geneva. The collection will launch Spring/Summer 2013. Additionally, two new two new references have been added to the popular Linea collection, set to become available in stores in Sept. 2013. Stay tuned for more LIVE updates from Geneva this week at SIHH and GTE!